Protesters gather at Union Square in New York City April 14, 2015, during a demonstration against the recent shooting death of Walter Scott by a South Carolina police officer. The recent police shooting of Walter Scott, an unarmed black man, in North Charleston, S.C., sparked a fresh wave of national protests against police violence. Authorities arrested scores of demonstrators from coast to coast as part of a national day of action to end police killings of unarmed minorities, according to Reuters. In New York City, about 250 activists marched across the iconic Brooklyn Bridge. They carried signs calling for justice against “killer cops” and caused major delays during yesterday’s evening rush hour. 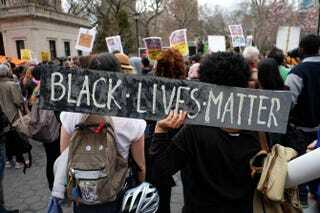 The New York Times reported that the police had arrested at least 34 demonstrators by early evening. About 100 mostly high school students gathered in Madison, Wis., to protest the fatal shooting of Tony Robinson. A white police officer shot the unarmed teen in March during a confrontation. There were also mass protests in California. In Oakland, scores of people rallied outside City Hall and then entered the building, holding “Black Lives Matter” signs, a local CBS station reported. And in nearby San Francisco, more than 100 protesters surrounded a police station and interrupted a Board of Supervisors meeting with protest chants. Meanwhile, police in Los Angeles arrested 15 protesters who had gathered on Metro Rail tracks. Reuters reports that the Stop Mass Incarceration Network organized the New York City march in response to the April 4 shooting of Scott. A video shows a white police officer gunning down Scott as he fled. Authorities there have charged the officer with murder. The demonstrators said that they want to ignite a nationwide discussion.